I use five weights for trout fishing. I have three that I use regularly for different situations, a Scott Radian, Scott Original G Series and a Sage TCR. These rods have served me well and I have not felt that any other rod would enhance my fishing catching ability. 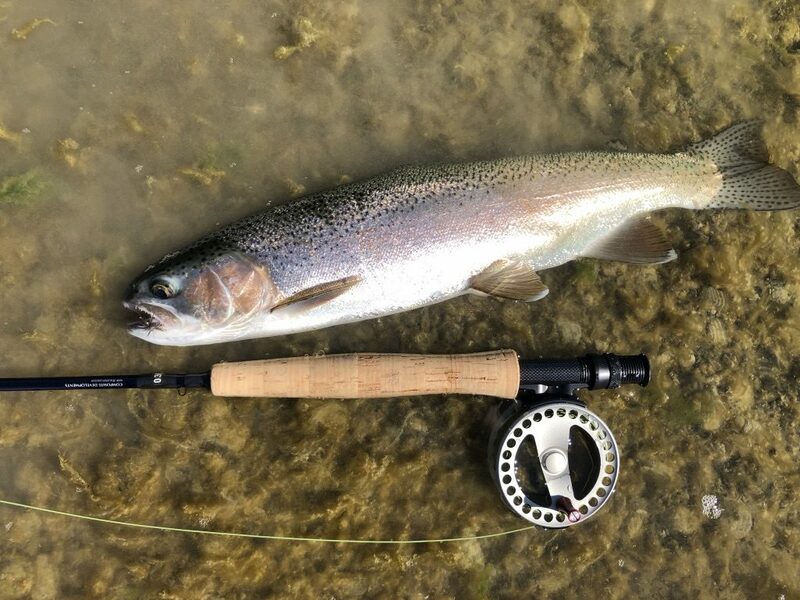 This changed after watching some exceptionally good videos of Rio’s Simon Gawesworth talking about Trout Spey and how Trout Spey rods should be three line weights down from your single handed rod. This lead me to question whether I could actually use the Two weight single handed rod I bought for perch fishing for trout about ten years ago. The rod is a Composite Developments Kiwi 2000 8 foot 3 piece, matched with a Waterworks clicker drag reel. The perch fishing was exceptionally disappointing. Cruising perch were suckers for just about whatever I threw at them, and none pulled any line off the two weight. So I only used it on perch a couple of times. I’ve fished the two weight both to rising fish and to fish on drop offs. As long as there is no wind it is functional, though I have not caught any fish bigger than three pounds with it. What fishing with the two weight taught me was the importance of getting technique right. Fishing a five weight allows me to take short cuts, make casts from sub optimal positions and not think as hard as I should about technique. My two weight works fine – but only if I use it properly. This means getting right into position before attempting to cast, and making sure I have the right amount of line out before casting. I need to know where the cast going to go exactly. I need to get the right amount of line out before casting and I need to make an accurate cast first time. The big difference between the two weight and the five weight is I cannot easily adjust my cast with the two and still cast accurately. I need to be much more careful in my positioning and not back my casting ability to save me if I have set up wrong. I am not going to use the two weight very often, but I did find using it very helpful in terms of forcing me to concentrate on my technique.